The obvious strength of The Old Republic, particularly if you’re playing an Imperial Agent, is its writing. But get carried away with your solo story and it’s easy to feel like you’re being punished – separated from lower level friends you might group with. No longer: with the launch of upcoming expansion Knights of the Fallen Empire, SWTOR will automatically scale players down for visits to lower level planets. 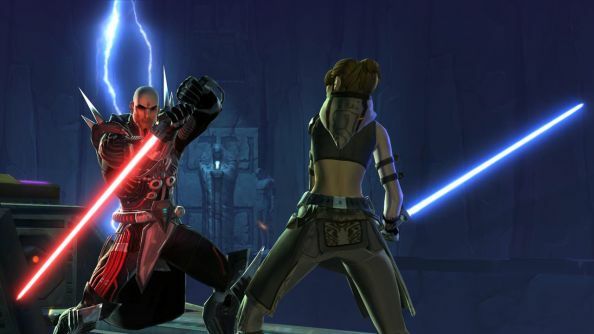 The Old Republic is, by our reckoning, the 11th best Star Wars game on PC. BioWare call their new system Level Sync. It’ll kick in if you land on a planet with a target level lower than your own – and automatically match you to the missions you’re going to be tackling. If you’re level 60 and decide to have a mooch around Alderaan, you’ll find yourself temporarily at level 32. Your stats, weapon damage and armour will be adjusted accordingly – but any abilities or passive effects you might enjoy at higher levels will remain with you. You’ll be compensated with scaled experienced, which BioWare reckon will see you “rewarded appropriately for [the] time investment”. The Austin studio have made XP changes to grouping in the same vein. Experience is no longer split between members of a group – but rather is based on the level difference between your most experienced comrade, post-level sync, and the mob you’re fighting. Sound sensible enough? It’s strongly reminiscent of dynamic level adjustment in Guild Wars 2. Where else in MMO-land would you like to see this sort of thinking applied?